Should BRCA2 mutation carriers avoid neoadjuvant chemotherapy? BRCA2 mutation carriers typically develop luminal B breast cancers. Data on the effectiveness of neoadjuvant chemotherapy in these patients are limited because of small patient numbers and lack of prospective studies. 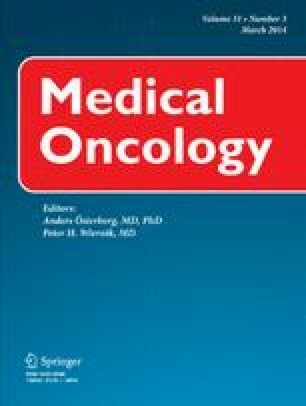 We used our 15-year genetic clinic database to compare retrospectively the pathological complete response rates (pCR) and rates of post-chemotherapy nodal involvement among BRCA2 carriers and BRCA1/2-negative (WT) patients with luminal B tumours, all treated with neoadjuvant anthracyclines ± taxanes-based chemotherapy. Twenty-nine BRCA2 carriers and 67 WT patients fulfilled the inclusion criteria and were analysed. Patients and treatment characteristics were represented. A pCR occurred in 3 (10 %) BRCA2 patients and 13 (19 %) WT patients (p = 0.43). Twenty (69 %) BRCA2 carriers and 34 (51 %) WT patients remained node-positive at surgery (p = 0.17). BRCA2 germline mutations are associated with a low probability of pCR and a high risk of axillary invasion. Alternative treatments are highly expected, and clinical trials are needed to set the best treatment regimen in this population.